Jypyä Pop (Turku, Finland) on 11 May 2017 in Animal & Insect and Portfolio. Swan has built a nest and apparently donned and is now trying to bake chicks. The record-breaking Cold May is not the best aid for hatching success. We trust that the weather does not affect them! Great spring scene! Nice shot! I hope they are doing fine. A nicely layered composition with great highlights in the tall grasses! I think the swans will be just fine as long as they are protected against predators. @Steven: Right now, especially the night, there are snowstorms, and in the evening rain or snow often falls. This is a very nice image of the swans with their young. @Shaun: Thank you. Those little birds swan beside the eider. They also have problems with cold weather. I wish them well with hatching their chicks. At least, there is sun today. The nest is so big!!! WOnderful image. I hope the cold does not hinder the hatching. @Ruthiebear: The swan is big bird. We all hope it. Thank you. PERFECT .. so eye catching . Il doit y avoir des tas d'oiseaux dans ces roselières. Your photo called my attention when browsing the thumbnails, specially the golden tall grass. Great framing. @MAU: A wreck, that golden gleam is the last summer rush that will soon crash when you start winding up. Right now it's a swan for a good shelter. @Curly: It is another of the birds that I know with certainty without birdwatch help. Lovely , very beautiful ! 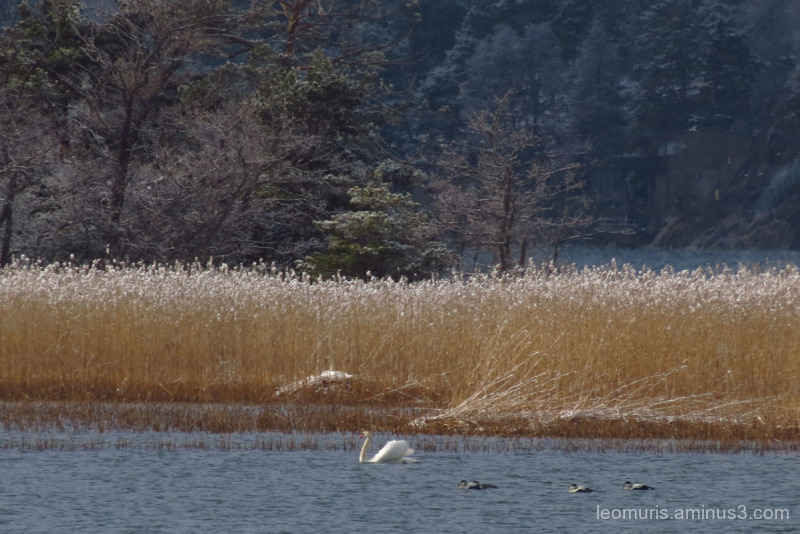 I can see a swan's nest hidden away, very nice swan lake image. @Lewis: Thank you. They are looking for protection from rush. The image is taken after a severe snowfall. Une petite famille charmante !